Justin Cupler has specialized as an automotive writer since 2009 and has been published in multiple websites and online magazines. In addition to contributing to CarsDirect, Justin also hosts a web-series car-review show and dabbles in the world of personal-finance writing. With auto conglomerates like General Motors, it is not uncommon to see multiple versions of the same vehicle filling similar slots within their numerous brands. This is the case with the Chevrolet Trax and the Buick Encore, as both vehicles sit on the same platform, use the same powertrains, and have some of the same components inside and out. What separates the Trax and Encore is that the latter is aimed at customers looking for a more refined crossover, whereas the former is more for budget-minded buyers. The fact that they are so similar in some ways and so different in others leaves us wondering which of these two is the better buy? Being more of a luxurious model, the Encore is, of course, better equipped inside and out. Features like 18-inch wheels, faux leather, soft-touch materials, heated mirrors, and more, all put the Encore well above the base Trax. 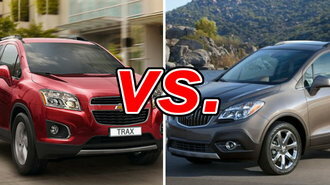 What’s more, feature for feature, the Encore actually represents a better value than the Trax. The Encore also comes with a slightly longer warranty. The Trax enters this competition with a lower price tag than the Encore, making it the best option for buyers with a very tight budget. Despite sharing its powertrain with the Encore, the Trax is slightly more fuel efficient than the Buick. What’s Better, Bang for your Buck or Low Entry Fee? Comparing the Encore to the Trax is like comparing a Granny Smith apple to a red delicious: they are similar in some way but their flavor drastically different. The Trax has a far lower starting price, but at the top end, the Encore is actually the better deal. So, the question for buyers is which one matters most to you? While the Trax is an acceptable option for buyers looking for a low-cost subcompact crossover, the Encore is simply more crossover for the money. What’s more, the extra cost of the Encore isn’t too significant when compared to the Trax, and Buick did a great job adding valuable content for buyers. Side-by-side comparison of features, pricing, photos and more!